What's in a name?In order to defeat the Nightmare Knight, legend dictates that the DreamSword must be autographed by seven princesses. But things get a bit complicatedwhen our heroes discover that the Flower Kingdom has no royalty! Luckily, the"king" of fashion, Mr. R is on the hunt for the new face of his styleempire, and whoever catches his eye will be named... (wait for it...)"Princess R"!Who will claim the coveted title? And why does it feel like we'reforgetting something important...? These are just the freaking cutest. Still loving the art and how the story line mocks the traditional "quest" story, and has a cast of diverse characters and villains. An incredibly sloppy installment to this series. The story was so jumpy and confusing I had to flip back several times to see if pages were missing from my copy. Characters will be together on one page and alone the next, with no transition. It's sort of explained at the end, but not well, enough to justify feeling lost for the entire story. Our heroes head on to the Flower Kingdom to find the princess so she can sign the sword and they can continue in their quest to defeat the Nightmare Knight. But things in the Flower Kingdom don’t go quite like normal. For one thing, the royal family disappeared ages ago. For another thing, the disaster master in the Flower Kingdom is tired of going by the script. Meanwhile, Peridot is confused about which side she should be on and the Knightmare Knight shares some of his deeper secrets with frie Our heroes head on to the Flower Kingdom to find the princess so she can sign the sword and they can continue in their quest to defeat the Nightmare Knight. But things in the Flower Kingdom don’t go quite like normal. For one thing, the royal family disappeared ages ago. For another thing, the disaster master in the Flower Kingdom is tired of going by the script. Meanwhile, Peridot is confused about which side she should be on and the Knightmare Knight shares some of his deeper secrets with friends he trusts.The plotline in this series veers from the normal in this book to explore some of the deeper motivations and backstory of how the whole quest cycle got started. It definitely adds depth to the overarching story if not being quite as adrenaline-driven as some of the other books. (There’s still some action, but there’s more chunks of dialogue and introspection than normal.) I think this series needs a character guide in the front or back of the book for readers. It is hard to keep ALL of the various side characters (there are over a dozen now) straight from book to book. That will be less of an issue when all the books are out and you can devour them one right after another, but when you have to wait several months between books it is a little challenging. I’m waffling between 3 and 4 stars for this one. I really liked the plot developments (and the scenes with the Knightmare Knight and Peridot were hilarious), but the flow of the book felt a little disjointed. So consider it 3.5. 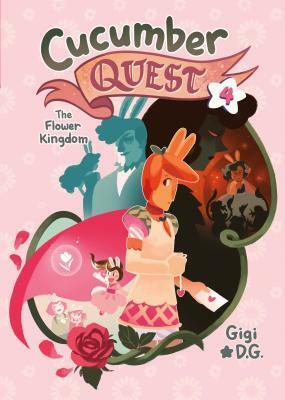 Overall, this series is a good choice for middle graders who like fantasy quests and cutesy graphic novels.Notes on content [Based on ARC]: No language issues. There are a few couples among the characters (both heterosexual and homosexual) but no kissing or anything. There are some fight scenes, but no one gets seriously hurt.I received an ARC of this title from the publisher through NetGalley in exchange for an honest review. Okay, okay, let's be clear: Cucumber Question is beautiful and amazing and I love it even when it doesn't make sense. And boy, does it not make sense here. Did I completely forget the third volume? We start off in media res (I think) with Princess Nautilus trapped in a garden. The Rosemaster has a lengthy, rambling discussion with the Nightmare Knight. Cucumber and crew discover that the Flower Kingdom lacks a princess. Carrot is redeemed. The Rosemaster has yet another lengthy, rambling discuss Okay, okay, let's be clear: Cucumber Question is beautiful and amazing and I love it even when it doesn't make sense. And boy, does it not make sense here. Did I completely forget the third volume? We start off in media res (I think) with Princess Nautilus trapped in a garden. The Rosemaster has a lengthy, rambling discussion with the Nightmare Knight. Cucumber and crew discover that the Flower Kingdom lacks a princess. Carrot is redeemed. The Rosemaster has yet another lengthy, rambling discussion. I don't know. So much happens but it all feels totally disjointed and not moving the plot forward. I get that things are unraveling for the Nightmare Knight as his cold heart fractures, but I have zero idea what's going on with the Rosemaster or Cucumber and all of his pals. And then, at the end, we're off to the next destination! Whoosh nothing matters!The Flower Kingdom is perhaps the most beautiful volume yet, but it's also somber and strange and really hard to follow. I love it, but I don't get it. As this series' stalwart heroes continue on their quest to collect the autographs of seven different princesses, they run into some problems. There are some surprises here as the Nightmare Knight turns out to be more complicated that readers had expected, and the Rosemaster has some more tricks up her sleeve. Carrot is able to draw on his inner strength for some courage, and the team moves on through the Flower Kingdom. Although I'm starting to care more about these characters, I still felt quit As this series' stalwart heroes continue on their quest to collect the autographs of seven different princesses, they run into some problems. There are some surprises here as the Nightmare Knight turns out to be more complicated that readers had expected, and the Rosemaster has some more tricks up her sleeve. Carrot is able to draw on his inner strength for some courage, and the team moves on through the Flower Kingdom. Although I'm starting to care more about these characters, I still felt quite confused as they moved through various scenes. It sometimes seemed as though folks were popping up out of nowhere, and the links between the scenes were confusing to me, perhaps because some of this was a dream world, but it would have been nice to have had some indications of time and travel between the panels. The colors used in this graphic series are lovely, though. Yes! So many different revelations in this volume. Finally, Periodot's feelings for Almond are brought to the foreground, we learn the Nightmare Knight's true motivations, Cucumber and Carrot both come into their own a bit, and we finally get to see Princess Nautilus' Pizza Delivery whenever you don't want a pizza in action.This volume seems a little jumpier than the other three, but that might be a side affect of the creator trying to reveal certain portions of the plot without spoiling others. Yes! So many different revelations in this volume. Finally, Periodot's feelings for Almond are brought to the foreground, we learn the Nightmare Knight's true motivations, Cucumber and Carrot both come into their own a bit, and we finally get to see Princess Nautilus' Pizza Delivery whenever you don't want a pizza in action.This volume seems a little jumpier than the other three, but that might be a side affect of the creator trying to reveal certain portions of the plot without spoiling others.Still highly recommended and I am looking forward to the next bit. I'm always surprised by this series. The characters are adorable (even the villains) and the plot is always so fast-paced and I'm always on the edge of my seat and can't wait for more. Waiting is the worst part. How are these books so damn cute?! I love the LGBT+ representation in these graphic novels and they make my heart so happy. I'm not giving a synopsis of this one because i don't think I can say anything without ruining the story, so just go read it, okay? I love this series a lot but I felt that this story was a bit disjointed and I got confused a few times. I feel like things abruptly happened or dream sequences popped up without making the start and finish of them very clear. Still, I really enjoyed this volume and look forward to the next. It’s cute and funny but the story is very jumpy. Can be hard to follow along sometimes. How dare this book make me love its villains so much. Also, the Sir Carrot arc in this book makes me so happy! always and so incredibly adorably drawn. This volume was SO GOOD. Absolutely darling, wonderful representation, feels everywhere, and BEAUTIFUL ART. I'm in love. An enchanting little read that will leave you wanting to read it again and again. Brilliant illustrations. This continues to be adorable—the friendship between Peridot and Nightmare Knight is everything! So excited to have introduced this series to my book club. ohhhh boy did this one bring the feels. LET THEM ALL BE HAPPY! also the art in certain scenes is beautiful. This is one of the most romantic of these books, and they are just adorable and hilarious. Nightmare Knight is quickly becoming my favorite character!